While we’ve long been suckers for succulents, it seems the cactus has knocked these popular perennials off their perch. Because, although the cactus has long been dominating the wardrobes of the most fashion-forward, it’s quickly making its way through the homewares sphere, where you’ll find it in prints on bedspreads and other furnishings, but importantly, the real thing too is here to stay. 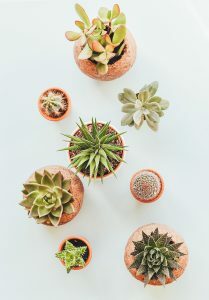 Despite the fact that few plants are as easy-care as the cactus, there are some rookie mistakes that can be made when it comes to caring for these sharp staples. Not providing enough sunlight is at the top of this list. Your cactus will make itself at home on a windowsill because, although it only needs to be watered now and then, sunlight is key to its survival. They are also night-workers, producing oxygen while we sleep, which makes them a popular addition to the bedroom.